This session is about assessment and management of patients presenting with palpitations to the emergency department. The term palpitations is defined as the sensation in which a person is aware of an irregular, hard, or rapid heartbeat. The presenting complaint of palpitations is one of the more frequently encountered reasons for attendance to the Emergency Department (ED) and the second commonest cardiac related presentation1 .The majority of patients with palpitations have a very good prognosis the challenge for the emergency physician is to identify the minority of patients who have significant cardiac dysrhythmia or underlying disease. The symptom of palpitations has varying meaning to patients and clarity must me sought. They are commonly described as an increased awareness of ones own heartbeat but also cover a sensation of fast or irregular heart beat or excessive pulsation. A key factor in patients deciding to seek medical advice is that this subjective awareness of cardiac activity is an unpleasant or distressing sensation. The causes of palpitations are numerous but can be broadly split into cardiac and non-cardiac causes (see Table 1). Palpitations have an underlying cardiac cause in 43%, are due to anxiety in 31% and have no specific attributable cause in 16% of patients. The overall prognosis for patients with palpitations is very good; this reflects that the commonest finding of ambulatory monitoring is either benign ventricular or atrial ectopic beats3. However, palpitations may indicate significant structural disease or arrhythmia and should prompt careful consideration of risk in the individual. Previous medical history must include checking for a history of structural heart disease and a family history of sudden cardiac death should be enquired for (if known) particularly in first degree relatives. Drug history must obviously be detailed as many prescription and over-the-counter medicines have cardiac effects. Included in this should be a specific enquiry about herbal and other alternative treatments as some of these contain surprising amounts of stimulants such as caffeine. Social history must detail alcohol and illicit drug use. Two factors associated with a likelihood ratio of 0.5 or less of significant arrhythmia were an underlying anxiety disorder and palpitations lasting less than 5 minutes. Physical examination must be detailed enough to identify the numerous aetiologies listed in Table 1. A thorough cardiovascular examination is essential with evaluation of the rate and rhythm of the pulse, careful auscultation of the heart and assessment for signs of heart failure. Features suggestive of cardiovascular or respiratory compromise must be elicited (ie. hypoxia or hypotension); these may be a cause or a consequence of the underlying pathology related to palpitations. It is important to evaluate for systemic signs of illness including the presence of pyrexia, pallor (anaemia), metabolic disturbance (eg. thyrotoxic features), and alcohol or drug intoxication. A brief psychological assessment is also appropriate to detect the presence of heightened anxiety. Twelve lead ECG recording is clearly the primary diagnostic test and if temporally correlated with symptoms of palpitations this will have a very high yield revealing the presence or absence of an underlying arrhythmia; if this is the case, a confident diagnosis can be made. 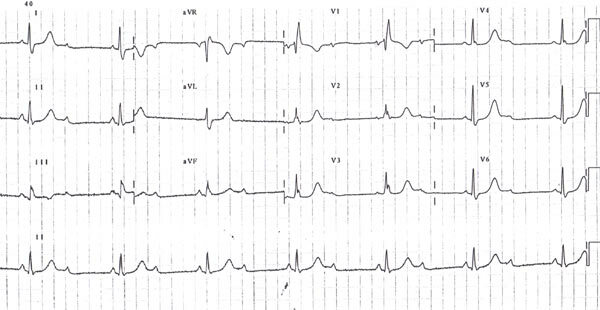 Any of these abnormalities may indicate a potential underlying aetiology for the presenting symptoms: Pre-excitation may indicate recurrent SVT, prolonged QT interval and findings suggestive of Brugada Syndrome may herald recurrent VT, atrioventricular block may produce symptomatic bradyarrhythmias, etc. 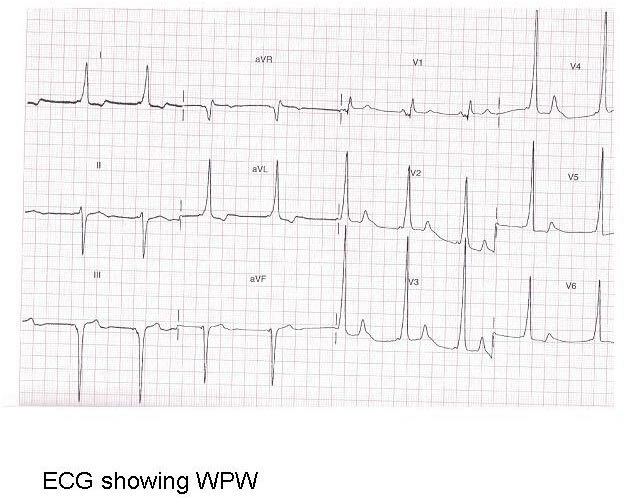 Carefull examination of the resting ECG, even in the absence of symptoms, may reveal the underlying cause of a patients palpitations. 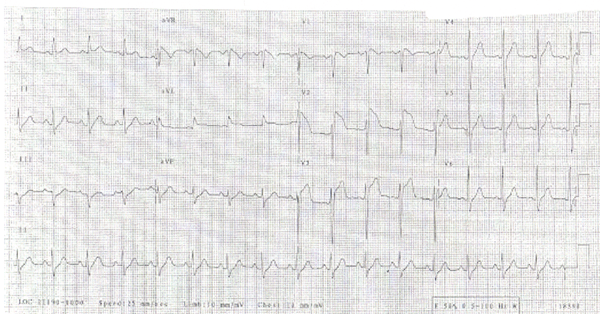 The patient may be displaying an arrhythmia on ECG monitoring at the time of assessment. If this is the case manage the arrhythmia as per current guidelines. In the case of the haemodynamically compromised patient resuscitation and emergency management as per Advanced Life Support should be provided. Where a specific underlying cause has been identified for a patients palpitations (either cardiac or non-cardiac), management will be determined by the specific causal pathology. In asymptomatic patients without demonstrable arrhythmia the immediate challenge is to identify those who require emergency admission for diagnostic purposes and subsequent treatment. Patients who had adverse symptoms or signs during the palpitations. Patients with implanted cardiac devices suspected of malfunction. Patients with a family history of sudden death (eg, Brugada Syndrome). Patients who require admission for investigation or treatment of an underlying cause or precipitating illness, for example acute coronary syndrome, electrolyte disturbance or endocrine disorder. Patients for whom admission is not necessary will fall into two groups: (i) those for whom an innocent diagnosis is confidently achieved (either cardiac or non-cardiac) and (ii) those whose symptoms have resolved and in whom no specific aetiology has been demonstrated and they have none of the high risk features above. Careful risk stratification is required to determine which patients require urgent admission for further investigation and management. (iii) Is further investigation required if a diagnosis is not made? Patients with a suspected arrhythmia (eg. pre-excitation on their ECG) or structural heart disease (eg. a murmur on auscultation) but without high risk features mandating admission will require referral to cardiology for follow-up, further investigation and management. For those in whom a specific diagnosis is not made or suspected in the ED, subsequent investigation will vary depending on the frequency and nature of symptoms. Methods of ambulatory monitoring will vary from 24 hour recording to more long term event monitors. Selection will depend on the exact nature of the palpitations. Daily palpitations, for example, will be recorded by a 24 hour Holter monitor but palpitations that are very infrequent yet produce adverse clinical features may warrant an implanted recording device to determine the underlying rhythm. Referral back to the patients general practitioner for follow up and discretionary cardiology referral. This would be suitable for low risk patients who report occasional missed beats. Referral directly to cardiology for out-patient follow-up. Referral for ambulatory monitoring +/- echocadiography and subsequent cardiology follow up. In patients where structural heart disease is suspected then it is appropriate to arrange an outpatient echocardiogram directly. Patients discharged from the ED pending general practice or cardiology follow up should be given advice with regards to future episodes. Patients should avoid stimulants such as caffeine, alcohol and nicotine. It is useful to keep a record of episodes and any associated symptoms. If the palpitations recur patients should attend the ED if they are persistent or are associated with adverse features. Finally it may be useful to ask patients to attempt to terminate suspected SVT for example by teaching them one of the variants of the Valsalva maneuver. Overall prognosis for patients with palpitations is very good with most being of a benign aetiology. Approximately 43% of patients have a cardiac cause for their palpitations. Anxiety is diagnosed in nearly a third of patients presenting with palpitations. There is a very wide range of aetiologies, both cardiac and non-cardiac. Patients at risk of serious adverse events require admission. Patients with suspected arrhythmia or structural heart disease require referral for cardiology follow up. Low risk patients can be referred back to their general practitioner for follow up. Bikkina M, Larson MG, Levy D. Prognostic implications of asymptomatic ventricular arrhythmias: The Framingham Heart Study. Ann Intern Med.1992;117(12):1053-4. Weber BE, Kapoor WN. Evaluation and outcomes of patients with palpitations. Am J Med. 1996;100(2):138-148. Abbott A. Diagnostic Approach to Palpitations Am Fam Physician. 2005 Feb 15;71(4):743-750. Antonio Raviele, Franco Giada, Lennart Bergfeldt et al. Management of Patients With Palpitations: A Position Paper From the European Heart Rhythm Association. Europace. 2011;13(7):920-934.